So after writing about my trials and tribulations on not having enough brain cells to remember something I thought about 10 minutes previous, I took your suggestions to heart and purchased a digital voice recorder. No, not the one that comes FREE! with this bag (although it waaaaas tempting; that Buxton Organizer looks amazing! I've always said a purse isn't a purse unless it can hold two water bottles, an umbrella, wallet, phone, makeup, glasses, notebook, calculator and another 50 kilos of miscellaneous crap you never even thought you owned). But I digress, I was looking for a voice recorder, not a knapsack purse. 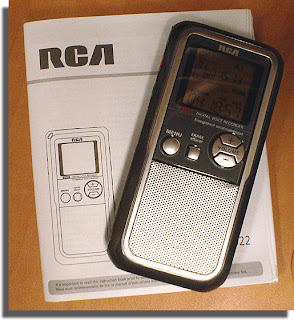 Instead I bought an RCA model that records for 18 hours… and with my verbal diarrhea, that should be just enough. Myself, why the heck am I recording, then TYPING out my posts? Wouldn’t it be easier, faster AND more entertaining to just post my random/weird/trivial thoughts as a podcast? No, No and definitely NOT. 1) Easier? Ha! I still haven’t figured out how to do anything but turn the damn thing on, record individual clips and listen. 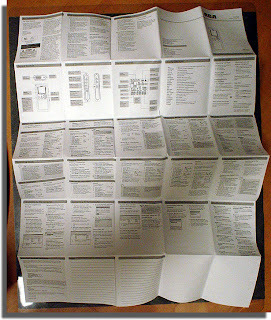 All the other bells and whistles are explained in this Easy To Follow User ... um ... "pamphlet". Unfortunately it didn't come packaged with the magnifying glass required to decipher the .0001 point typeface, so I still have to figure out tricks like how to insert, bookmark, delete, lock and download the files to my laptop. 2) Faster? I think not. Until I master the fine art of editing audio files 12,000 times before I hit the "Publish" button like I inevitably do with written stories, it will take me forever to splice something even remotely intelligent together. 3) More entertaining? Nooooooooo. Nonononono. *I* can’t stand the sound of my voice, so I wouldn’t dare subject friends (and/or strangers for that matter) to such excruciating torture either. So I guess I'll stick to traditional written blogging. But at least now with my brand spankin' new RCA 64M, I'll never forget a post idea again. If I remember to bring the recorder with me, that is. No, No and definitely NOT." This is why I like reasding your blog so much. You are HILARIOUS! I envy you your ability to post such witty, entertaining blogs. As for your voice, most people can't stand listening to their own voice on recordings. It has something to do with hearing your voice OUTSIDE your head, because it never sounds the same as INSIDE. I'm sure we would all enjoy hearing your voice though. If you can find it quickly enough in that mega purse of yours with that 60 kg contents, although women are very good at blindly groping in their purses and coming up with the required item, unless a tampon feels too much like a lipstick. You'll do great and you'll leave yourself lovely messages in that lovely Canadian accent, which I really want to hear just once, please. Pretty please. Or do you sound just like any other North American? I speak good English, with a Dutch accent and I have a little bit of a hard time saying "three." Yes, you may laugh about that. But not in a "Oh my God, knee slapping way." btw,we all love your blog...so u can't stop posting...ok???? LMAO - My 6 year old keeps telling me how much I NEED a Buxton Organizer!! Haha! That was hilarious! I needed that laugh :) I hate the sound of my voice too, but people say they like it, but I cringe. CRINGE. That said, I'd take a voice recorder for the sole purpose of recording ideas. It was a good investment, I think!! Enjoy the weekend! I sympathise with you. I often have ideas and then promptly forget them. I too have a dozen gadgets I thought might be useful. I have a fab new mobile phone (cell phone) that has a voice recorder but for some reason I always press the camera button and end up photographing myself while talking into it! It might come in useful one day - put it in 'that' drawer you have for such items. Honeybell: But if you DO get that bag, be sure to carry some pain meds in it... you'll need them for the sore shoulder from carrying all that weight! Tismee2 and Lady Banana: I was going to use my phone too, but it doesn't record long enough... but it's a good way to "jot" ideas on too! At least people won't give you weird looks talking into it!! !Have fun! I'd forget the batteries too. And, I bet your podcasts would be hysterical!!!!! I think you should have a contest and the winner gets to listen to one of your recordings. That would be well worth the entry! I'm with you--I'd forget the damn thing and completely lose the train of thought looking for it. I had to laugh at the Buxton Organizer. My son, being four, is highly influenced by marketing. He also knows I don't have enough "purse space" to carry all of his toys AND the stuff that should actually go in my purse on a daily basis. He was convinced for several months that the Buxton was the answer to that dilemma. Fine as Wine (Natalie) - blog hoppin'! My work has one that you can upload the audio files directly to your computer. They even have software that converts the audio to text. It is insane. I'm lucky I know how to turn my tv on! This so reminds me of the movie Night Shift where Michael Keaton keeps noting his 'ideas' into a recorder. "...note to self, feed mayonaise to tuna for instant tunafish..." (paraphrasing there). Oh, don't forget how it will look to others while you are talking jibberish into that thing. My 6 year old wants/begs me to get the buxton organizer so that I can find everything with a blind fold on...somehow that would be entertainment to him. Lunanik: Well, I don’t know about hysterical…but they would be memorable! Vegas Princess: A contest where the winner loses?? Now that's just crazy talk. Natalie: Hah! Yeah, I went thru that stage with my daughter… I used that diaper bag long after she was out of diapers; it held toys from then on. Mommy Bits: Ah, cool. We have digital recorders at work too; getting people used to them instead of the tapes is proving to be no fun. Tara R: Glad to hear I’m not the only one! Nola: Now don’t get me started on THAT! A whole other blog topic to explore. VE: I haven’t seen that movie in years; but I do remember that… now I want to watch it again! Noble Pig: Hahaha! That DOES sound entertaining!!!! Hmmmm. I think I want one of those. I hate it when I'm driving and a blog about farts comes to mind, but I can't stop and write it down. The world is missing riveting stuff by me not having one of those. I love anyone that says 'verbal diarrhea'. I found your great blog online when I was trying to find support for the same RCA 64m digital voice recorder that you have. I have been using it without issues, until recently. After working for over ten years in a profession, I thought that going back to grad school was a good idea. (Oh, another story.) I use my recorder to tape lectures as I review my notes. So recently, I haven't been able to convert my VOC file to a wave file. Odd. Have you had any simular problems? On top of that, I tried to get some support from RCA directly, yeah, I can't even find that it exists to them. Bummer. I have tried that too, and nothing helps me. I feel for ya.